This will be a relatively difficult week (after Sunday's half) - a VO2Max w/o (1200m repeats), 15k time trial/tempo run, a 21 miler. Mon- Cloudy, 55F, Recovery 5: My quads were sore from yesterday's run. I'll have to see if I can get in my VO2Max w/o tomorrow. I've had a mild quad strain on my left leg and some inflammation near my right ankle for a few weeks. It does not really bother me while running or walking but I figured I'd see if a PT could do something about it (given that it'd anyway be covered by my insurance). The PT massaged the focal points after an ultrasound. He gave me some strengthening exercises and also applied some heat. It seemed helpful - lets see what happens after a few more appointments. Tue- Treadmill, VO2max 10 w/4*1200m @ 5k w/ 2 min jog in between: I was prepared to bag this run if necessary. I started with 3 miles at GA and then hit the intervals. Luckily, I made it through without any issues. After that I got in the strengthening exercises assigned by my PT. I wish I had the discipline to continue with these year round. The last time I used ankle weights they really helped but then I got lazy and stopped. Fri - 10 min XT: On the stationary bike at the PT's office. - Cloudy, 49F(46F), 0.67 miles wu+cd + 15k time trial: My legs have been feeling "dead" for the last couple of days. When I was struggling at 9 min/mile pace during my warm-up I wondered how I would be able to get in 8 min miles leave alone a time trial. However, as I began running the time trial some how the pace came back. The run felt good and my pace was consistent all through. I ended up averaging 7:11 min/mile for the 15k! I think our brain must have different neural networks controlling different kind of runs. So we end up struggling at 9 min/mile but are fine at 7 min/mile. Yeah right, me and my stupid theories - now I'm trying to explain my running at the level of neurons :) 223.4 miles for the month. 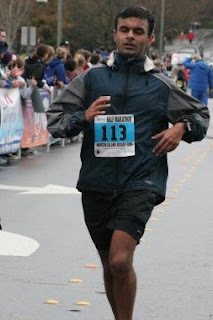 I signed up for the Mercer half in January as a fitness test for my Spring marathon. I had not done any hill training so I realized that there was a chance that I would not beat my time on the flat Phoenix RNR half course. When I saw the rain on waking up I wondered why I was running this race. I like running but did I really have to run in the cold rain? Well, I had paid for the race so I donned my waterproof layer and headed out. Ideally, I would have liked to just run in a T (but that would have meant chaffing all over in spite of using body glide). I was lucky to find parking near the start. I left my warm and dry car still whining about the rain. I waited for the race to start under the roof of a bank with a few other runners. A couple of them mentioned that they had driven down from Portland (as least I just had to drive 10 miles to get here :)). As I walked to the start it stopped raining and I was able to take off my hood! The first mile was a loop around the starting area. I had to jump in from the pavement since there was no place to get in before the start. However, there was no bottleneck and in seconds I had running space. I did not want to start out too fast and thought I kept it in check. I distinctly remember going past a mansion on this mile on my training run in Mercer last year. Like last year my Garmin lost signal on this mile so I had to wait for the mile marker to get a split. The velcro timing chip on my ankle got undone. I had to stop and fasten it again. For the rest of the race I found myself looking down to make sure it was still there. I did not want to end up not getting a time. A guy points at the skies and the scenic view across Lake Washington. Quite a panoramic view! Around this point I also wished I did not have 2 pieces of pizza before the run (not ideal pre-run food but luckily no major damaged was caused). Around this point we started passing the walkers. The had started two hours ahead of us. I don't think I'd have the patience to walk for so long - it isn't easy to do. There was not much support out there but everyone out there was cheering. The volunteers (many school kids) were great. The last mile was mostly a run down a steep downhill except for a steep climb midway that was not fun. As I ran down I hoped I was not trashing my quads too badly (very similar to my last leg at HTC - I did do some damage then). This was the 35th running of the Mercer half so not surprisingly it was well organized. The race was benefiting Colon Cancer research at Swedish. The organizers appeared to be focused on maximizing the contribution towards their cause. That explained why there was only water (and no sports drink) on course but that's OK. I'd do this run again just for the scenic loop around Mercer Island along Lake Washington. In general I felt I could have gone on for a few more miles at this pace after the half marathon on FLAT terrain. However, my quads could not deal with anymore uphills. There's no faking training on hills. I had kind of expected this after the Seafair experience. My time here projects a 3:24 odd marathon time on a course of equal difficulty. On a flattish course and after a taper it might even mean a 3:20-3:21. We'll see in five weeks. I will be front loading my miles this week so that I can get in a mini-taper for the Mercer Island half. It will be interesting to see how I hold up on the hilly course. 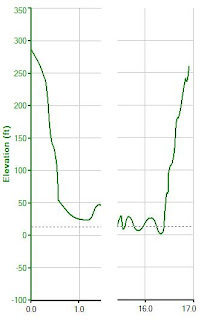 My runs are on flat terrain except for a 250 ft hill over 0.5 miles at the end. This hill should see me through the two more gradual 100ft hills at the Eugene marathon. Mon - Treadmill, VO2Max 8 w/5*600m @ 5k, 90s jog in between: I think I'm beginning to stop dreading these VO2Max workouts and might even be enjoying them! I don't know what the gym had going on with their heating but this run was almost a simulation of a hot summer run! Wed - 33F(29F), Sunny, GA 11 - A chilly but sunny (importantly a break from the rain!) day to kick off Spring. Considering that this was a GA run it went pretty well. The entire second half was at sub-8 pace without much effort. A couple of miles even went sub-7:30. Mon - Cloudy, Dark, 42F(38F), GA 8: I didn't get in my run in the morning. I was pretty sore since it was hardly 12 hours after my long run yesterday. As usual I ended up going to sleep late on Sunday. Seeing the rain outside was not inspiring either. Wed - Treadmill, VO2Max 9 w/ 5*1000 @ 5k w/ 2 min jog in between: I tried to do this workout yesterday at the Lake Washington high school track in Kirkland. However, I found this track to be locked as well like the high school in Redmond. I don't get it - why do they have a problem letting the public use their tracks? It's our property tax that is paying for these and we're trying to use it when there are no kids in school. It's not like there is a fitness epidemic in WA. In MA they had no problem with this. I was so put off by this that I took a rest day. Thur - Cloudy, 34F(30F), Medium-Long 11: Less than 12 hours after yesterday's run. More of the "tired legs" theme. By the end of the run I was feeling it. Sat - Cloudy, Light Rain, 53F, 12mph winds, Long 17 w/14 @ PMP: Given the half next week I was not too worried about hitting PMP for 14 miles. However, I did want to at least make sure that I had 14 sub-8 miles. I managed that comfortably, with all except for the first 3 being sub-7:50, averaging 7:51 for the 14. It was a nice run and went by quickly since I was focused on my pace. While returning I did have to again run into the wind but it wasn't as bad as last week. The rain and wind was less intense. My legs were less tired so I was able to push harder. Also, perhaps it's easier to run into the wind at a faster pace. This week is the start of what Pfitz calls the "Race Preparation" mesocycle (the last mesocycle was "Endurance and LT"). This cycle will mean lower overall mileage but higher quality miles - more at VO2Max effort than LT effort. He calls this periodization - prioritizing training in blocks of Endurance, LT & VO2Max. Another focus of this mesocycle is to run long runs on tired legs. Long runs would therefore simulate the final miles of the marathon rather than the first few miles. This is also one of the themes of Hansen's training plans. As a result I will be running a significant portion of my weekly miles over the next 5 weeks on the weekend. Mon - 60 min XT: There's still some residual quad soreness after yesterday's run. Hopefully, the XT will help get the blood flowing and I'll be good to go for tomorrow's VO2Max workout. Wed - Cloudy, Rain, 50F - Medium-Long 11: Less than 12 hours since my last run. My quads did complain at times but for the most part they behaved themselves. Sun - Cloudy, Rain, 62F, 22-27mph gushing winds - Long 17: The first half of the run felt great & effortless. I was running with the wind, my legs were loose after yesterday's run and it felt great to be running without a layer. The second half more than evened things up. I had to run into gushing winds and a very steady rain. Probably the worst conditions I've run in all year. If I had not been in the middle of nowhere I might have stopped running. However, running was the most efficient way to get back home so I kept at it. If I see similar conditions forecasted for any marathon I'm planning to run I'm bailing out... I got to appreciate DST - I started running at 4pm but still finished in light!